Interests - Postman Pat, Star Wars, Doctor Who, How To Train Your Dragon, Top Gear. Loves fast cars, dinosaurs, space and sci-fi, sea. Listening to stories on CD and being read to. Collects postcards from all over the world.. Please DON’T send food to Adam as he is nil by mouth. Adam was born by emergency c-section on 2nd March 2007 after becoming distressed before labour. He was born blue and floppy, and required immediate resuscitation. Once revived Adam was still very unwell and was immediately sent from North Tyneside to Middlesborough James Cook Hospital. He spent 2 weeks in PICU, being treated for hypoglycaemia, pulmonary hypertension, seizures and lung dysfunction as he had aspirated meconium prior to birth. Three weeks after birth, Adam suffered more seizures and became critically ill. He was admitted to Newcastle General Hospital, where he was discovered to have had 2 haemorrhages in his brain since birth. Adam regained consciousness after 7 days but continued to be very poorly, and remained in hospital for a further 10 weeks. He has since had two further bleeds in his brain. Since discharge, Adam has been diagnosed with spastic quadriplegic cerebral palsy, affecting his right arm most severely and also making him unable to sit unaided, stand, crawl or walk. He is making slow but steady progress in learning how to make his body work the way he wants it to. He is unable to form words, but enjoys making quiet noises. Adam has bilateral partial lamellar cataracts, making it difficult to focus on moving objects. Adam has feeding difficulties and is unable to swallow without aspiration into his lungs. He often has chest infections and is regularly hospitalised for treatment. In January 2010 he had a gastrostomy fitted, and now receives all his nutrition via a feeding tube. Excessive stress and medication has meant Adam has developed stomach ulcers, which sometimes bleed. He also suffers from epilepsy, with severe tonic clonic seizures, leading to a trip to A&E and usually a stay in PICU. Despite all his troubles, Adam is a happy, lively boy who makes friends everywhere he goes. His grins and giggles keep his stressed parents and his loving little sister smiling. Adam had eye surgery in December and January to remove his many cataracts and hopefully increase the amount of light getting in. Surgery went well and he was allowed home quite quickly both times. It has taken a while,but we think his general vision has improved,although he will never see very well due to nerve damage. Adam is still on the waiting list for surgery or further treatment on his knees and ankles, and under observation for the straightness of his spine and hips. He still experiences a lot of pain and doesn’t sleep well. Nevertheless he keeps a smile on his face, enjoys days out, rugby matches and a constant supply of superhero films at the cinema. He had his 11th birthday in March, and received so many amazing cards and gifts. Thank you everyone! Hannah is awaiting further treatment for her liver and stomach problems. She is under the weather most days but carries on regardless. She is continuing to fundraise for lots of charities with her project Hannah’s Helping Hand, and particularly enjoyed making Christmas decorations for Post Pals in December. This month she is promoting Autism awareness at school. 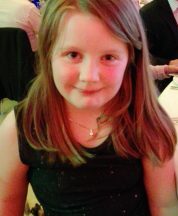 Hannah was 9 on April 6th, and she too received so much lovely post. Thank you again! Very sadly, Adam’s best friend recently passed away. It was very sudden and he is going to miss her very much. We are all heartbroken for her family. Hannah’s best friend is very seriously ill at the moment and so we are doing all we can to stay positive and have lots of fun. We are so very grateful to everyone who sends post. The last few months haven’t been easy for A & H, and all that love in the post has been a great comfort. We are looking forward to the Post Pals Chessington Trip (especially Hannah who is nuts about rollercoasters). Thank you Post Pals for everything you do. Adam is still waiting for leg, knee and eye surgery. He is also back on the waiting list for hip and spine consultants. As the winter approaches we are keeping a close eye out for chest and ear infections . He remains his happy self most of the time. Hannah has been diagnosed with liver disease and autism spectrum disorder. She is working hard to cope with and overcome her difficulties, and is continuing with her monthly charity work with Hannah’s Helping Hand. In November she will be fundraising for Post Pals. In the last few months, Adam’s health has been going downhill as he seems to be in more pain than ever. The tightness of his knee/leg/ankle muscles is now too bad and medication isn’t helping. We also learned recently that his eye sight has deteriorated significantly and his cataracts are now obscuring most of his central vision. Adam is relying more and more on sound and touch to make sense of the world. We are very grateful for all his audible post, as we need to keep him constantly supplied with new stories, and of course as he isn’t keen on sleep, it helps us through the long nights! Due to all this, Adam will be having a number of surgeries in the coming months (waiting lists permitting) on his legs and eyes. Adam’s history of respiratory problems means the doctors don’t suggest these things lightly, but we hope that the stress, discomfort and hospital stays will reap great rewards for Adam in the longer term. Despite everything, Adam keeps cheerful. He has been awarded a second swimming qualification at school and was recently the winner of a North Tyneside schools Star Award for his “Can Do” attitude and positivity. The highlight of his year however, was definitely meeting Mister Maker after his Whitley Bay show! Hannah continues to be unwell. She has been diagnosed with a liver disorder (we don’t know what yet) and has been having lots of tests. She hates them, gets very stressed, and as a result her anxiety has gone through the roof. She continues to pursue her charitable project Hannah’s Helping Hand (she has a page on FB), and recently celebrated the 2 year anniversary with a tea party for our local carers centre , the 31st good cause she has supported since June 2015. In July she overcame her fears and did a zip wire challenge for Calvert Trust, raising over £200. In March, Hannah was honoured with a Points of Light award from the Prime Minister, for her outstanding voluntary work and contribution to society. Of course, we are extremely proud and very very happy for her. Thank you everyone who sends post. The terrible two have received some wonderful things, including, to mention but a few, amazing paper cuts (Hannah hugs her Olly Murs every day), Adam’s fantastic Doctor Who cross stitch, letters and postcards from all over the world, books, teddies and very special extra smiles and monthly project parcels. Thank you everyone, from the bottom of our hearts. Happy New Year to everyone from all of us! Since our last update, Adam has been having more difficulty with his epilepsy, which is still difficult to control, and constant pain in his legs and arms. He is now seeing a new set of neurology/orthopaedic consultants to try to find an answer, hopefully without the need for surgery. Thankfully, his latest x-rays have come back ok, so we can put his spinal problems aside for now. Adam continues to be brave and keep smiling, despite some let downs recently. He had another set of tests to see if he can return to taking food and drink orally, but we were disappointed. His swallow is still very unsafe so he will continue to be fed via his gastrostomy (feeding tube directly into his stomach). This is the most upsetting recent development, as Adam did once take food orally (he has been nil by mouth for over 6 years), and is really desperate to get back to eating chocolate lollipops, mashed potato and whippy ice cream. He will have more tests later this year, so we remain ever hopeful. Hannah continues to make us proud. She is still unwell, with an as-yet undiagnosed illness, causing her a great deal of pain and sleeplessness. She is having lots of tests and scans, and despite being terrified of needles she is always brave. Hannah has carried on with her charity project Hannah’s Helping Hand, which is now in its third year. In 2016 she helped 17 charities and good causes and raised over £1700 with her friends. We have lots of plans for 2017 including a sponsored run and walk, craft sales, baking and even possibly a zip wire if H gets the medical all clear! In December, Hannah attended the Chronicle Champions Awards, as a shortlisted nominee in the Champion Fundraiser category. These are awards in the North East area for people who have made an outstanding contribution to their local community. Hannah was shortlisted alongside two adults, and, although she didn’t win, we all had an amazing night and Hannah got the moment in the spotlight she truly deserves. We are very grateful to everyone who supports Adam and Hannah by sending them post. Christmas was amazing for them, with all their cards and gifts making them both feel brighter on their bad days, and certainly very loved. Another big thank you to all the people who fundraise for Post Pals. We were very lucky to be included in the Chessington Trip, and had an unforgettable experience. We wish everyone a peaceful, happy and healthy 2017! Thank you everyone for all the lovely post and emails Adam and Hannah have received this month. Adam is doing ok but is in a great deal of pain and still having seizures. He had one particularly bad incident where we thought he was having a stroke and was very poorly, but he bounced back as he tends to do and tries to stay strong. Hannah is trying her best but is still struggling with ill health. She is constantly tired and fatigued in her limbs, and struggles to sleep at night and stay awake during the day. She has seen a consultant and is waiting for tests. Her Year 2 SATS were a little stressful, as she has difficulty concentrating and can’t cope with worry very well. Despite this she is continuing with her project Hannah’s Helping Hand and enjoying updating her blog (hannahshelpinghand.wordpress.com) and being of help to the community. We won’t be able to come to the Post Pals party but we wish everyone a wonderful time and a fantastic summer! Adam has had mixed health recently. Despite our hopes, his epilepsy is getting worse and it is becoming difficult to control. He seems to be in more pain and needing many more stretches and doses of painkillers than ever before. He will be seeing various consultants in the next few months to try to make him better.On a positive note, we are managing to keep him out of hospital more, even when he is very under the weather. This is great because he often recovers much more quickly in the comfort of his own bed. Adam is trying hard, but finds day to day life very tiring , especially school. We keep him happy with endless Star Wars dvds and of course all his fantastic Post Pals post. Hannah has been generally quite unwell for some time now, so we are waiting for her hospital appointment for tests. She keeps cheerful and is happy to devote all her energy to her charity project Hannah’s Helping Hand. Last year she helped 10 charities, and hopes to do even more this year. Christmas was relaxed and mostly quiet and we all had a great time. Adam and Hannah have received so much amazing post. We had to spread out opening them over many days of the Christmas period. Our heartfelt thanks go out to everyone who thought of our terrific twosome, and the people who email or message to keep in touch with how they are doing. We send all our love to our friends at Post Pals and to everyone sending post to any of the Pals and siblings. The summer has been ok for Adam, with fewer seizures and hospital trips, except for one scary day at school in July. We may (fingers crossed) be on the way to getting his epilepsy medication right, which will make a difference to Adam’s life. Adam still struggles with pain in his knees and feet, but now it is also in his arms too. His muscles and tendons are just so tight that they constantly ache for him, plus the medication to ease them makes him sleepy and we have to fight to keep him awake some days! As always though, Adam keeps a smile on his face and a bit of mischief twinkling in his eyes every day. We had a lovely short break in Blackpool over the holidays. Hannah got to dance in the Tower Ballroom which she says was a highlight of her life. We all went to the top of the Tower, which Adam loved, and also went to the zoo. Hannah has started year 2 at school and has been a little apprehensive. It’s a lot to take in but she is working hard and having fun. Hannah has started a new project called Hannah’s Helping Hand. She is aiming to help at least one charity each month, so that she can make a difference and learn more about the world. So far, she has helped Marie Curie, the local food bank, a local community group called The 5p Bus, and Post Pals (of course). Post Pals is also the charity for December. This month she is doing a sponsored walk for the Alzheimer’s Society. Adam has had his 8th birthday recently and received lots of lovely cards and gifts. He had a dinosaur themed party and was happy and healthy for the day! Generally, not much has changed. Adam still struggles with his seizures, which disturb his sleep and upset him. He is also needing more pain relief for his legs, knees and ankles. He is still smiling though and trying his best. He is growing fast so already needs a new wheelchair etc. School is going ok, he is learning his alphabet and numbers, and simple reading. Hannah is about to turn 6 at the beginning of April. She is growing up too fast! She is doing well at school, keeping cheerful and trying to help out more with Adam. She has chosen to learn all about Adam’s conditions so she can understand and do more for him. They remain the best of friends, they really do love each other very much. Thank you, as always, to everyone who sends post to Adam and Hannah. Hannah is now responsible for reading letters to Adam, which they both enjoy. Adam continues to keep smiling and tries hard every day. He is struggling with increased pain in his legs and still has a troublesome bowel. We are still trying to find a good balance of medication to control his seizures, but he is brave about it. He isn’t sleeping well, so we are listening to a lot of Paddington stories in the middle of the night. Adam is doing well at school, especially in his swimming, which he loves. We are hoping to start introducing a little more solid food this year, as he is desperate to eat and not too happy watching other people enjoying their food. We have a few family treats lined up for the year to keep Adam and Hannah’s spirits up. Hannah is working hard and enjoying school, and continues to be a loving, caring sister to Adam. We grow more and more proud of her every day. Christmas was great, and very busy, and Adam stayed well for most of it. They loved their elf and reindeer letters and gifts. The children have received so much lovely post and we want to say a massive thank you to everyone. Recently they were delighted by their special balloons sent by Post Pals. We had just that afternoon been in a car accident (everyone is fine apart from a little whiplash for me and damage to our brand new WAV) so they were brilliantly timed! Adam took his to school to share with his friends in the sensory area. We think it is important that everyone who supports Post Pals knows how much of a difference their kindness makes. Not long after Adam joined, he was sent a Postman Pat cd, which he still listens to now (a lot) and is the one cd we always take to hospital because it is guaranteed to make him smile. He also received a fish card in his first week, which is on his bedroom door. He has a big “A” sent to him by a lovely friend which he keeps on his shelf and wants to hold everyday. Adam loves to look at the large collection of postcards he has amassed (his favourite is one of a donkey sent from Ireland). He also has some Makaton story books, and some wonderful Mr Men and Postman Pat books which were decorated to make them sensory books, which go around in his bag all the time. Hannah has a collage of her name and fairies on the wall by her bed, and of course her beloved baby Maria was a Post Pals gift too. And not forgetting Indie, our lovely dalmatian who has had many adventures with us. We have a little metal heart hanging from our bathroom mirror which makes me smile every time I see it, and there are so many other precious things which mean so much to Adam and Hannah, and to us. Thank you to everyone who sends post to our special two. Happy New Year everyone. We hope 2015 will be your best year yet! Adam has been his usual happy and hard working self over the last few months. He is trying his best with his physio, although as he grows the tightness in his knees, ankles and toes, is getting worse and he is troubled by increasing pain. We are looking at options for stronger pain relief and hoping this won’t making him too sleepy. His posture is improving, as is his grip and extension of his right arm. He is spending more time in a standing frame, which is helping him with his shoulder and head control. All this effort is very tiring and he is usually exhausted when he gets home from school. School continues to make Adam very happy. He is working hard at his communication and we are starting to chat using Makaton more. He is also using communication software on his iPad to make choices and greet people. He loves to be part of the conversation! It’s early days, but he’ll get there we hope. Adam is also getting started with a bit of reading and counting. He is very pleased with himself! Recently, the biggest difficulty Adam faces on a daily basis is his epilepsy. It is becoming very difficult to keep his seizures under control so we are trying new combinations of medication in the hopes of finding the right one. As always, Adam tries his best to stay cheerful and makes us very proud. Hannah recently finished her first year at school and is doing very well. She takes time out every day to talk, read or play with Adam, and they continue to be the best of friends (although Adam could possibly do without hearing Let It Go ten times a day). Adam and Hannah receive so much lovely post and we are truly grateful. Hannah’s reading is good enough that she can now read Adam’s cards and letters to him. They are very cute together, opening their envelopes and getting excited. A massive thank you to you all for the kindness and love you show our brave two. Everything is appreciated and looked at over and over again. Happy New Year to everyone. We hope you had a lovely Christmas! Adam and Hannah enjoyed their Christmas very much (although Adam wasn’t too well) with lots of treats and so many wonderful Post Pals letters, cards and gifts. There is mixed news about Adam recently. It is now clear that having the fundoplication surgery last year was one of the best decisions we ever made. He is keeping his feeds and meds down and putting on weight. It has been a pleasure buying him lots of new clothes in larger sizes and finally seeing him get a little bit of a tummy. Adam has been in and out of hospital for short stays of one or two days, usually due to his epilepsy. He is having regular seizures which are quite frightening for him, and us. We are trying new combinations of medication to try to stabilise his condition, but it is a real balancing act between controlling seizures and not letting him get too drowsy (which is a side effect of most anti-epileptic drugs). He has recently been so badly affected that he is spending all day asleep. We will keep trying to find the answer! He is also struggling with increased pain in his limbs and continuing bowel problems. However, Adam is a fighter and he keeps going whatever comes at him. He is trying very hard at school, with regular physio and speech therapy. 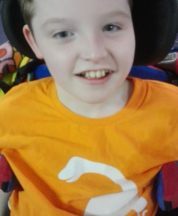 He has started lessons in Rebound therapy (on the trampoline) which he loves, and he is a member of the after school Boccia club. Adam loves sport and seems to have a real talent for this one! Adam now has an iPad and is learning to use communication software to give him the voice he so desperately wants. Adam has no spoken words so this, with practice and patience, will open up the world to him. He is finding the whole thing very exciting, although so far we can only manage yes/no answers, but it’s a start. Hannah is now at first school and is doing well. She enjoys reading and writing the most. Adam and Hannah are the best of friends and Hannah is a great help to us in looking after her brother and cheering him up on his bad days. We are very proud of them. They really are our heroes and we would fall apart without their smiles. We would like to say thank you, yet again, to all the kind people who send post to Adam and Hannah. At Christmas they were overwhelmed by the gifts and cards. Adam loved the reindeer letters and has so many new postcards. Thanks also to everyone who emails – Adam looks at them on his iPad and always smiles when he sees a message is for him. Adam and Hannah think of you all as their friends and everything they receive brings a smile to their faces. Sending lots of love to you all. Adam continues to do well after his surgery and is slowly starting to put on weight. He still has the urge to vomit, but because he can’t he is learning to cope and is getting used to it. He has been busy at school, doing swimming, sports, trampolining etc and cookery. He can now make a cheese sandwich with a little help, which made me so happy I cried a little. Adam got a great first report from school. He is a cheerful, friendly, popular and hard working little lad, apparently! He completed the Children’s Cancer Run in May with Dad, Hannah, Grandpa and Uncle Richard. The two children raised over £100 for this worthwhile cause. Some of our Post Pals friends were kind enough to sponsor us, so a massive thank you to them! 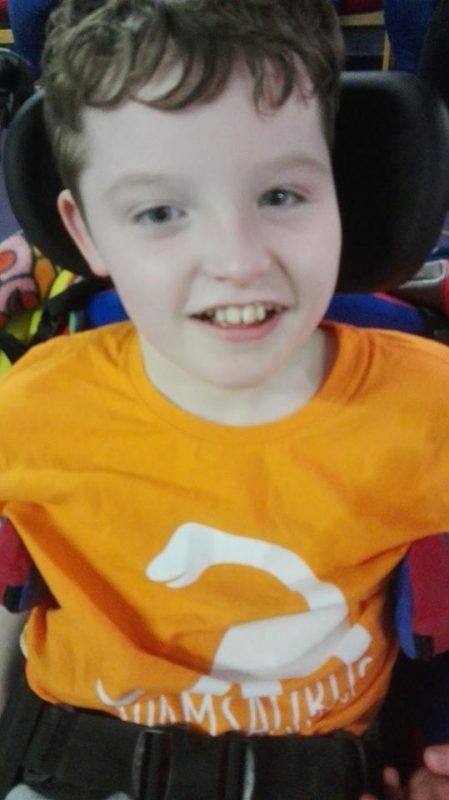 In September Adam is going to start an after-school Boccia class, which is very exciting, because he really enjoyed watching it during the Paralympics. He has been having a quite a bit of trouble with seizures, minor and serious, short and prolonged, of all types, and we have had quite a lot of ambulance rides to A&E recently. The seizures have made him very tired and seem to affect his limbs quite badly, making him very stiff. Adam has been having extra physio daily to help with this and as always he is being very brave. His pain seems to be getting worse, so we will need to raise that with his consultant in September. He has been missing his school activities and friends so we have been trying to stay busy and get out and about over the holidays. We’ve been to the cinema, visited friends, explored the coast and countryside and even met a dinosaur! Hannah starts school in September and she is very excited. She “graduated” from nursery in July, with a ceremony and a party. She’ll miss her friends at nursery but she is definitely ready for school now and eager to start learning. As usual she has been very loving with Adam, looking after him with gentle affection when he is having a bad day. Thank you so much to everyone who has sent the little ones post in the last few months, I am pretty rubbish at remembering to post thank you notes, but please be sure your lovely letters and parcels do make a big difference to our two brave children. Adam now has over 100 postcards from Britain and around the world. Adam’s health is very up and down at the moment, with bad days popping up and surprising us, so every envelope holds a treat to make the days a little easier. Sending lots of love and best wishes to all our Post Pals friends, the Pals and their families. Adam had his fundoplication surgery on 18th April and it all seems to have gone well. He was admitted 3 days earlier to be on overnight ventilation, to prepare him for the anaesthetic as his breathing hasn’t been so good recently. We were told to prepare for 2-3 hours in theatre and in all we waited for 5 hours which was a bit nerve wracking. Once he was in theatre, the surgeons noticed that he needed another procedure as well as the fundo, so they decided to do that at the same time. This meant Adam had a lot of sore wounds afterwards (9 keyhole surgery points, two in a VERY delicate place!) and was on a lot of painkillers for a week or so. Adam coped extremely well with the surgery. The doctors had an intensive care bed and a blood transfusion ready for him to recover and were expecting to have him ventilated for a few days, but amazingly he didn’t need any of it. The next day he was sleepy but cheerful, and well enough for visitors and to play with Hannah a little. He was discharged after 5 days (it would have been earlier but he had to have some fasting tests for a couple of days), which was great as we’d been told to expect up to 3 weeks in hospital and we were home in 10 days! He had a further week off school, went back for one week part time and is now back full time. It’s like he’d never been away! The surgery seems to have worked. Adam is now no longer able to vomit, which means he keeps his milk feeds down and hopefully he will start to put on some weight and gain some strength. It has caused some problems as now he can’t cough hard enough to dislodge anything in his throat, but he is learning to cope with it. He has also been able to come off two of his medicines which is great for him as we always thought they didn’t suit his tummy. So far, we are pleased with the results of his surgery. It wasn’t comfortable for him and we are so very proud of him for being brave and putting up with the pain and worry with a big smile on his face! Hannah was a very good girl while Adam was in hospital, going to pre-school in the morning and visiting him in the afternoon. She played with him, drew him pictures and told him stories. She is doing really well at school, enjoying her dancing lessons and learning to read. She can read her name, and other key words. We look at her Post Pals post together, which she is finding even more exciting now she can read some of it herself! Thank you to everyone who has sent post, letters, cards and gifts to Adam and Hannah in the last month. Adam put lots of his post up on the wall of his hospital room, which was admired by the many doctors, nurses and visitors he had. The four of us send all our love to everyone at Post Pals, volunteers, Pals and their families. We have had a relatively stable last few months, Adam’s health hasn’t been too bad and he has been doing well at school. He has had a couple of nasty chest infections which make him very tired and he has missed some school this term, which he wasn’t happy about. His breathing difficulties seem to be getting worse and we are now having to regularly test for dips in his blood sugar as this might be causing his new seizures. Adam will be admitted to the RVI Newcastle on Monday 15th April to prepare for his fundoplication surgery. He is going to be put on a ventilator overnight for a few days before to help his poorly lungs cope with the anaesthetic, so the actual op won’t be until Thursday 18th. While he is in the hospital he will also be having some tests to do with his blood sugar. We are hoping he should only be in for about 10 days altogether, but this depends on how well he recovers from the procedure. Whatever happens he is going to miss quite a bit of school. We have told Adam what will be happening and he is being brave but is obviously worried and unhappy about it. We are going to arrange lots of fun activities and visitors for him, and hope we can keep him smiling. Adam had his 6th birthday on 2nd March and he was well! We had a family party, dressed up as pirates, danced and played games and he was very happy. Hannah is 4 on April 6th and will be having a Teddy Bear’s Picnic to celebrate. Hannah is doing well and enjoying pre school. She had a nasty accident in March, when she fell and hit her head off a wall, losing a front tooth and splitting her top lip very badly. Hannah had some minor surgery the next day and had a week off school to recover. She was a very good girl about it and now talks about it like it was an adventure. A very big thank you to everyone who has sent post to Adam and Hannah in the last couple of months, especially for Adam’s birthday and Easter. We can see how much care and effort is put into everything and we are very grateful. We send lots of love to everyone at Post Pals. Adam has been mostly well in December and had a very happy Christmas. The rest of the family had a nasty bout of norovirus but Adam seems to have avoided it. He has had quite serious stomach and bowel problems, and seeing him in such severe pain is heartbreaking. Adam tries so hard to keep smiling and has been very brave. Aside from this he has been happy and contented, although we think he’ll be very pleased to go back to his lovely school next week. We were stunned when we realised that Adam had done a whole term without a single sick day, something he has never managed before in his life. Long may this continue! Adam and Mum, plus Uncle Richard, took part in Adam’s school fundraising Pudding Run on Whitley Bay seafront on Boxing Day morning. It was cold and we only managed about half of the course (his wheelchair is heavy!). Adam enjoyed himself so much and laughed all the way round, getting lots of cheers as we ran. As we haven’t heard from the hospital, it looks like Adam won’t be having his surgery in January so we’ll have to chase that up, again. Christmas was lovely. Adam and Hannah were in good spirits, and enjoyed their gifts and being surrounded by loving family and friends. They had lots of time to play with their 4 month-old cousin George who they adore. The children received so many lovely cards and gifts this Christmas and we are very grateful to you. Their cards covered two doors in our house and Hannah kept asking to look at them and to hear the names of the senders again. Thank you everyone for your kindness. We don’t know what 2013 has in store for the family, as these days Adam’s condition is very unpredictable. We will carry on giving Adam and Hannah the best possible life and deal with the more difficult days as and when they happen. Post Pals has given our lovely two so many smiles, giggles and surprises, often when they were desperately needed, and we cannot thank you all enough. We wish you all a very happy and healthy 2013! Adam has been mostly well and happy recently. He has had some chest and bowel problems but seems to cope a little better than he used to. He’s still in a lot of pain but is slowly learning how to tell us so we can help him. School is going well. Adam won a prize at Awards Evening for his improvement and hard work. He beamed from ear to ear as he collected his certificate, and loved the applause. Adam is completely settled at school now. He has lots of friends and the staff seem very fond of him. He goes swimming every week, loves using the plasma screens, drawing, making music and playing in the sensory area. He has been busy rehearsing for his Carol Service, including some Makaton signing of some carols. We are waiting for confirmation that Adam will be in the RVI Newcastle for his fundoplication surgery in January. He’s going to be in for about 2 weeks, which will be difficult for him as he’ll miss a lot of school. It’s possible he’ll have to go into PICU beforehand to ensure that he is stable for the procedure. We’re not looking forward to seeing our little man in so much pain post-op but we hope the results will help him to get on with his life without the constant vomiting. Hannah is happy at nursery. She was Frosty and a donkey in the Nativity and is very excited for Christmas. A huge thank you to everyone who sends the children their lovely post. We wish you all a very Merry Christmas and a happy, healthier 2013. Adam’s health has been up and down as usual in the last few months. His seizures have been quite frequent and knock him out for days, but he copes well and needs to be admitted to hospital less often than in the past. Adam is still suffering horrible, painful bowel problems and we’ve been unable to help him with the vomiting. We’re still waiting for a date for his fundoplication surgery, after which he’ll need to be in hospital for a week or more. We need a date soon or else it will get dangerously close to Christmas! A year late, Adam has finally started school! From his first day he loved it and he is well looked after and learning so much. He enjoys assembly and swimming. We have seen such a change in him. He is noisy now! Shouts all the time and trying so hard to form words. His signing is improving, he is more alert and doing really well with the communication technology. School really suits our Adam. He still misses his nursery friends but he has made some lovely new ones too. The school is excellent (which was why we fought so hard to get him in!) and we’re all delighted. Hannah has started pre-school, is settling in quite well although she is a little nervous, and is even doing extra dance and French classes! Some of our Summer plans didn’t work out because of Adam’s ill health. We couldn’t use our tickets for the Paralympics which was very disappointing for all of us, but Adam just wasn’t up to the travel. We watched LOTS on the tv though. Adam is now a massive fan of David Weir and Johnnie Peacock, and has also decided he wants to learn the javelin and horse riding. Hannah changed her mind every day about her favourite Olympic and Paralympic sports, but definitely wants to be gymnast and a triple jumper. We enjoyed lots of Jubilee events too. We had a party for friends and family, Adam loved the River Pageant on tv and we even got to see the Queen in person (in the wind and rain!) at the opening of Tyne Tunnel 2. The kids both loved all the exciting events of the Summer, and we will have lots of happy memories. Adam and Hannah love getting all their fantastic post. Massive thank yous to everyone, including Jenny, Jen and Emma who write regularly, everyone who sends Adam postcards from all over the world, and the several Becky’s (Hannah asks if her post is from one of her Beckys). We promise to get better at sending out thank yous! A couple of final things – a big thank you to Kate D for everything she has done for Adam and Hannah. We hope you get your well deserved rest and relaxation! And congratulations to everyone at Post Pals on the fantastic new website, which we know has taken so much hard work. We love it. Our love and thoughts are with all the Pals and their families everyday. What a busy few months! We moved house in April to be closer to family, and we’re still only half unpacked. Adam now has a large downstairs bedroom which he loves, and we have a sofa in it so there’s a bit of comfort for Mum or Dad when we’re caring for him at night. Hannah’s room has mirrored wardrobe doors, so she’s happy too. Adam had another week long hospital stay at the end of March, with seizures, pneumonia, bowel issues and chicken pox! Despite our best efforts, Hannah caught it too and was very poorly for a week or so, although she was very brave about it. This coincided with her 3rd birthday, but she managed to have a great time anyway and received some lovely cards and gifts from Post Pals people. Seizures have continued to be a problem, with two ambulance trips to A&E in two days in May. His vomiting has worsened a little, so looks like his fundoplication surgery is unavoidable. We had hoped for this during the summer, but looks like he will have to miss time at school for it. We have had great difficulty getting Adam into school. He needs a special needs placement and the local authority told us there were “no places” so we would have to send him to Durham or Northumberland. Two daily hour long trips in a taxi with a stranger would be impossible for a 5 year old boy with serious medical issues so we said no. After a lot of fighting, Adam will now start at a closer school in September, a year after he should have been starting. At the moment they are planning to put him in a year behind his age group, but as we’re not happy about that, watch this space. It seems a shame that the most vulnerable in society have even harder battles to fight to get what they need, just to achieve the same as the “normal” children. We’ll keep fighting though. We hope Hannah will be able to attend the nursery class of the mainstream school which runs along side it. As Adam has been at home with Mum and Hannah (we have no respite care in place), we’ve been trying to get about as much as possible and see the world. Trips shopping, to the cinema, theatre, parks and castles have excited the kids. Currently, Adam is devoted to all things Tintin (especially Snowy the dog) and Hannah is enjoying baking cakes and then eating them. We will be gong to some Paralympic events in London in August/September which will be great. Adam and Hannah continue to receive lots of fantastic post, which makes them feel very special. Some parcels are kept for difficult days, and letters are read to them before bed. Photos of scary spiders (scary to Mum, not to the kids) are put back in the envelope very quickly. Adam has had some amazing postcards from all over the world. We mark the countries off on a map, look at where they are on his globe, and put the cards in a special album. Paul and I are very grateful to everyone who sends the children post, emails or contacts us on Facebook. I’m making some great new friends via Facebook and Twitter. We’ve been looking at photos from the party and we’re so pleased it went well. We attended via the Facebook Unofficial Virtual Party which was a lovely bit of fun. We send our love and best wishes to everyone at Post Pals, especially all the Pals and siblings, and we hope the summer is sunny and happy for you all. Life has been all ups and downs for the last month. Adam had a communication assessment and did well, impressing everyone with his ability to use touch screen technology and tell us exactly what he wants. We’re hoping to arrange a loan of some communication aids which can be attached to his wheelchair. It’s very exciting for him and us because we’re certain that Adam has a lot to say! Adam’s health hasn’t been so great. He has had a couple of seizures, but thankfully minor ones. Unfortunately, he then developed pneumonia and vomiting virus, and this meant that for the second year in a row, Adam had to spend his birthday in hospital. We made the best of it though, with help from our wonderful friends and family. Adam shares his birthday with me (mum) so we had two cakes and roomful of decorations, cards and presents. Adam received dozens of cards and gifts from Post Pals people and we were overwhelmed by your kindness, yet again. Despite being confined to a hospital ward we had a lovely day. Adam also had a sleep study last month, but he didn’t sleep much. He was quite stressed about the whole thing and he ended up vomiting throughout the night, had a choking episode and a small seizure. Although the study was limited, it does look like Adam has periods in the night when he stops breathing so we’ll be seeing the respiratory team in April. Hannah will be three soon. She has asked for a little party with Adam and we are happy to oblige. It may turn out to be a very big party! Thank you for all Adam and Hannah’s post. Any art/craft gifts are being used to make post for other Pals, so after we’ve had fun making, we can pass those smiles on. Adam’s Nursery class have been drawing pictures to send as well. The four of us send all our love and thanks to you all. Adam has had a pretty good month in January. We seem to have managed to control his vomiting and this has improved his health generally. His chest is still troublesome and he is having difficulties with his bowel which is very painful for him. He had his first seizure since May last year, unfortunately quite a serious one, but recovered quickly and didn’t have to stay in hospital overnight. Adam is making more and more noise, shouting when he’s happy and crying when he is in pain. This might not sound so great but it’s wonderful that he is finally starting to express himself, instead of suffering, literally in silence. He has a sleep study on 16th February which should help us to deal with his breathing and oxygen problems. We should have results by March or April. Adam is excited for his 5th birthday in a few weeks, and about moving house sometime in March, to be closer to school and family. Hannah will be starting pre school after Easter. She’s getting to be such a big girl! I would have to say that the family has been happier and healthier recently, and long may it continue! Thank you to everyone who sends Adam and Hannah post (and Paul and me too!). They opened their Valentines this morning. Adam went all shy and cute, and Hannah declared “Look how many people love me!” Paul and I are so grateful to all of you. Our love and thoughts are with all the Pals, families and volunteers. It’s been a while since our last update and so much has been happening. Adam has had his ups and downs, chest infections and now a troublesome bowel. He keeps smiling but seems to be understanding more, and these days we can see the worry every time he goes near a hospital. During the summer, we were in and out of various hospitals for short stays as Adam was having real problems with his chest and breathing, causing worrying drops in his oxygen levels. Generally Adam tried to stay cheerful. We had a great family holiday in the Lake District, during which Adam was mostly well, and we got to see lots of boats and steam trains, visited a great zoo and played in a tent in the garden. Adam had a couple of longer hospital stays in October and December and missed several nursery outings and his starring role as a reindeer in the Christmas play, which was very sad. He also had some surgery to change his gastrostomy tube to a button, plus some investigations of his throat. As a result of this, he has changed to a new milk feed, which has no undigested milk protein. In the month he has been on this, his vomiting has reduced dramatically and we’re very pleased. It makes day to day life for him a little easier and more comfortable. He is trying this milk for another couple of months before we decide if he will need a fundoplication, which we’re hoping to avoid. He remains nil by mouth, but does have flavoured lip balms to give him sweet tastes to enjoy. Adam now has his new wheelchair, which is much more comfortable and means he’s happier getting out and about. We’re trying to involve Adam and Hannah in as many memorable experiences as possible, so we followed the Rugby World Cup and filled in a wall chart, he’s had several visits to the cinema, and we have got tickets to some events of the Paralympics in August which we hope they will both find fun and inspiring. When in the RVI in December he got to meet several Newcastle United footballers, and even better, a whole squad of the Newcastle Falcons rugby team. This made his year! Christmas was very happy, with Adam well and very, very excited! So far 2012 has been better, Adam has been stable and happy and we’re making plans for holidays and moving house soon, as well as Adam starting school in April. Adam is our sunshine, and his determination and happiness in adversity is the generator that keeps our family going. Hannah is doing very well – still a talkative little thing, always asking questions, singing and dancing. She finds it difficult to understand Adam’s condition, but tries her best to look after him and plays nicely with him. They’re putting together quite a cheeky little double act! A few weeks ago, she offered to put on Adam’s shoes and walk for him to help him. Hannah struggles when Adam is poorly, especially during long hospital stays when she has to stay with her grandparents. She keeps going, and is there to cuddle us when we really need it. Hannah is our sweetheart, and makes us smile even at the saddest of times. We have been keeping up with the updates of other Pals and been pleased to read of some developments and saddened by others. We are always thinking of the Pals and the people who love them. We have some insight into how they might be feeling and they inspire us to try harder and keep going whatever the days bring. Our thanks to everyone who sends post to our little ones. They enjoy (and keep) every single thing. Quite often, the post they receive can change a difficult day into a happy one. We send our love to all the Pals, families, friends and volunteers at Post Pals and wish you a happier and healthier 2012. July and August (so far) have been better for Adam. He is now fully recovered from his surgery and has been discharged, for now, from the respiratory clinic at the RVI. The vomiting, chest infections and terrible pain in his legs continue, but as he gets older he seems more able to cope. Adam has never been one to cry very much, so when he does we know something is definitely wrong. His seizures have settled down a little too, so his recent change of medication may be working after all. He’s still getting chest infections every fortnight or so, and they tire him out, but he continues to laugh, giggle, smile and try his hardest to have fun, however poorly he’s feeling. As I type, he’s sitting on the sofa wearing splints and gaiters, listening to a story cd and laughing hysterically! The reintroduction of food and drink had to be delayed, which disappointed us all, but Adam was just too poorly to cope at that time. The first session has been rescheduled for this week, so hopefully it will go well. Adam can now say three words, with a lot of effort and concentration – car, yes and more. He uses the last one a lot! Adam is growing up fast and his Dad and I were very proud to attend his pre school “Graduation” on Friday. They did a little play (which Adam slept through sitting in his wheelchair, but then he was playing a tree so it was a very convincing performance!) and then put on gowns and mortar boards and received certificates from their key workers. Adam’s smile just beamed all the way through the ceremony and he was very pleased with himself. Adam is very popular at nursery and got a big round of applause when it was his turn. Adam won’t be moving on to school until summer term next year (as the council “can’t find” him a special needs school place but won’t send him to our choice in a different county), but a lot of his friends are now leaving. He’ll miss them a lot, as he is very happy at nursery and gets lots of love and friendship from the other children. Hannah continues to do well, talking ten to the dozen all the time and singing to Adam from her bedroom to his. We’re enjoying the summer and Adam is managing some time outside, either in his little gazebo, or sitting in his special swing, watching the world go by. The whole family (including grandparents and aunts and uncles) are going on holiday to the Lake District at the end of August, which we will all enjoy. Generally, Adam seems happy and contented, and determined, which is all we could ask for. Thank you, as always, to EVERYONE who so kindly sends Adam and Hannah cards, letters and gifts. They are both constantly delighted by their post, as are Paul and I. Hannah is now asking for letters to be read to her as bedtime stories! We send love, smiles and best wishes to all Pals and their families, volunteers and everyone at Post Pals. Have a lovely summer! Adam had his surgery on 16th May and was very brave. It all seemed to go well as Adam didn’t have any bleeding problems and we were lucky enough to be discharged the next day. It took Adam a few weeks to recover as it was very painful for him. He was a on a lot of painkillers which made him drowsy and uncomfortable. The second week of recovery coincided with a long awaited family holiday to the west coast of Scotland (the week of the gales and torrential rain! ), and it was good to get away. Adam and Hannah really enjoyed themselves, especially spending time with their friend Alfie (and Mum & Dad), and Paul and I feel we got a few days to relax for the first time in a long time. Although the procedure went well, it doesn’t look like it has been as effective as we hoped it might be. Adam’s breathing has improved, but his reflux is still very bad and he continues to be kept awake at night by it. He currently has another nasty chest infection so the doctors are now looking at putting him on a long term course of antibiotics to help him fight infections. The next step is probably going to be further investigations of the walls of his throat and a fundoplication, to help control his constant vomiting. There is good news too! In preparation for a videofluoroscopy in September, (to see if he is still aspirating into his lungs when he swallows), Adam is going to be weaned back onto food and drink. He has been nil by mouth for a long time now, and we’re quite nervous about this, but it will be amazing to be able to give him the food he loves again. It starts with water and weak juice, but will move onto pureed food and then some solids. As a baby, he loved pureed Brussels sprouts and cheesy mashed potato, so I’m looking forward to getting the food processor out again. It’ll be a slow process, and he will remain reliant on the gastrostomy tube for the majority of his nutrition for quite some time, but it’s a start. On 4th July, we heard Adam’s first word! It was late at night and he just wouldn’t go to sleep. He’d been babbling away to himself in bed for ages and his Dad went up to check on him. Adam was asked if he was being rambunctious (one of his favourite funny words – Adam LOVES funny words), and out of the blue, he said yes! We are so happy and proud, and he is very pleased with himself. He is attempting other words now, with Hannah helping him. In the last few months, Adam has mostly preferred to stay indoors at home with his comforts. He loves getting his post, listening to his letters and looking at his gifts and cards. He took part in the Children’s Cancer Run at Gosforth Park Racecourse on 8th May, pushed in his wheelchair round the bumpy course by his beloved Grandpa. He’s doing well at nursery, helped by his brilliant one-to-one support Coral, and growing up so fast we can hardly believe it. We had a Royal Wedding street party too, and Adam loved being King of the street for the day. Hannah has recently started to do one day each week at the same nursery as Adam, which she loves. They see each other from time to time during the day, without Mummy getting in the way! She is doing really well with her talking, ABC and numbers, and is thriving at the moment. Hannah is totally devoted to her brother (and vice versa) and has told me she is Adam’s special nurse sister. We’re very proud of how loving they are to each other. Thank you so much to everyone who sends Adam and Hannah letters, cards and gifts. Your kindness continues to make a big difference to our lives, often on very difficult days. Paul and I have booked to attend the Post Pals Charity Ball in October, and hope to meet some of you then. Our love to all the Pals, siblings and families, and everyone at Post Pals. Adam has been very brave but was a little upset this morning before his surgery. He has been recovering from the painful surgery in hospital this afternoon. We’d kept some Post Pals post aside and he opened some and inside was a smiley face balloon. This simple, thoughtful gesture, made a tired and poorly 4 year old giggle. He has fallen asleep tonight holding onto it so tightly. There was no sender, so to whoever sent this little gift, our heartfelt thanks. You really made his day bearable. Post Pals makes these wonderful moments happen. Adam has had an up and down couple of months. It was his 4th birthday on March 2nd and he took a cake and balloons into nursery for his friends. Unfortunately, he was taken ill halfway through the morning and had to be rushed to A&E (thankfully just next door). Adam spent the afternoon of his big day in the Children’s Unit at Wansbeck hospital under observation. The opinion is that Adam had a prolonged complex partial seizure, which caused him to lose consciousness for a short time. He was cheered up when his Dad brought a stack of his Post Pals birthday cards and parcels to open in the unit. Our plans for the day were only postponed until the following Saturday when we went out to the shops to spend his birthday money (Postman Pat toys were chosen) and have some fun at the soft play. March and April have seen a total of 5 trips to A&E and 3 stays in various North East hospitals. This has mainly been due to seizures, but that tonsil problem has been back and caused him a lot of breathing difficulties. Adam is on some new medication that hopefully will settle down his seizures and let him concentrate on happier things. We’ve been busy, usually having 3 appointments a week for all sorts of different treatments. He’s being very brave, but as he gets older he understands more and is becoming increasingly unhappy with trips out, as he always seems to think he’s going to hospital. His lovely post is helping though. We save things for days we know he’ll find difficult, to keep that gorgeous smile on his face! Adam is due to be admitted to the Freeman on 16th May for surgery (he’s having his tonsils and adenoids out) and investigations. Usually this would be relatively straight forward, but because of Adam’s blood abnormalities it’s going to be a tense time. We’re hoping so much that this surgery will help him to overcome his breathing problems, maybe his terrible reflux which makes him sick several times a day, and even allow him to start talking to us. I can’t express how wonderful it would be to hear our little boy say something (anything!) to us in his own voice! Please send positive thoughts his way on 16th May. Adam’s little sister, Hannah, had her 2nd birthday on 6th April. She’s a cheeky, silly, loving little girl who adores her brother and looks after him all day long. She is having trouble coping with the separation from me and Adam when he is in hospital but tries her best and is always there with a smile, cuddle and a kiss for Mummy and Daddy when we most need it. Hannah received some lovely Post Pals cards for her birthday – she proudly declared to us that she had lots of letters from all the Princes and Princesses! Thank you to EVERYONE who has sent post to Adam and Hannah in the last couple of months. You really are making a difference to the lives of two brave little ones. Paul and I are so grateful to you all. It’s been a very difficult time recently but your kindness and generosity has helped us through it. We send our love to all the Pals, siblings, families and everyone at Post Pals. It’s been a mixed month for Adam. He has made good progress with his speech and language exercises, using switches and eye pointing more and more, but also attempting a little Makaton to communicate (he knows the sign for chcolate already!). The use of his right hand, which only 6 months ago was virtually zero, has reached a level now where he can grasp things and move them about. We took delivery of his new powered bed this month, which is helping him to sleep more upright and so means less pain and vomiting in the night. He also likes to take little rides on it in the mornings. We’ve put some of his Post Pals pictures and cards on the wall by his bed so he can see and reach for them. Adam doesn’t sleep particularly well, so he is very glad of the distraction. Adam’s ophthalmologists told us his sight has not deteriorated as they thought it might, so they are going to put off his surgery for at least a year (we were expecting it sometime in 2011), and possibly (fingers crossed) he won’t need it at all as he seems to cope well despite his cataracts. We’re still waiting for a date from ENT at the Freeman in Newcastle. Adam saw the top surgeon a couple of weeks ago and he seemed to think Adam was haemophiliac, which was the first we’d heard about it! Hopefully, we’ve managed to sort this out and once Adam has the thumbs up from the haematologists about his platelet count, we’ll get a date. The surgery has its risks, as Adam has had clotting problems in the past, but they’re going to be on hand for a transfusion if necessary. We’re just praying for a straight forward procedure and a short stay in the ward afterwards, as Adam is getting more nervous and unhappy in hospitals these days. Generally, Adam has been his happy, giggly self, but those nasty chest infections (and eye infections, and ear infections) keep on coming and the antibiotics just get stronger and stronger. He didn’t miss any nursery days this month though, for the first month ever. It’s difficult for us to believe but our lovely little man is going to be 4 this month. He’s packed so much into his short little life, but it still feels like last week that he was born! We’re very proud of our beautiful boy, who perseveres despite all the pain and discomfort, the doctors and physios messing him about and the frustrations of having to rely on us to push his wheelchair when he wants to be running around with his sister and his friends. Adam is very excited about his birthday and we’re going to make it special for him. Thank you to everyone who has sent Adam and Hannah post in the last month. Adam takes his favourite things into nursery to show his friends and is very pleased with himself. Thanks for the past couple of months to (and this is just some as I’m doing it from memory) – Dominic & Gethin, Sally for the lovely angel, Libby, MJ, Salome, the Hutchinsons, Ann, Ali & Alex, Christine in Australia (Hannah says Kangaroo all day long now, bouncing round the room), Tracy, Elaine & family, Sarah G, Jenny, Emma, and to William for the lovely surprise letter. If I’ve missed you out, my apologies, but be sure your post has made all of us smile. Thanks also to Dottie for the lovely letters. We log into the blog now so Adam can practice his computer skills. Finally, to Adam’s Valentines – you made him all shy and giggly – and we were so happy to see that. Adam and Hannah have enjoyed sending cards and letters to other Pals, and we send all of them and their families our love. Adam has had a better few months, with some good news and finally some future plans. In November he was Page boy at his Auntie and Uncle’s wedding and had a wonderful time, smiling and laughing all day. Since then he had yet another chest infection, and this time he was prescribed some much stronger antibiotics which made him tired and nauseous. They did the trick though and we were very pleased that he was well for Christmas, for the first time in his life. Adam and Hannah had a great Christmas and New Year, were treated over and over again and met Father Christmas three times! After Christmas the excitement took its toll a little and Adam has been under the weather again, but he has avoided hospital and is on the mend now, but back on those same strong antibiotics. Adam seems to have had quite a growing spree in December too, so he is looking a lot more grown up these days. He continues to progress well with his speech and language therapy, and we feel he is getting closer to saying his first word (probably going to be Pat, as in Postman Pat), which would be just brilliant. The strength in his limbs seems to be improving too, but with that comes more muscle spasms and more painful nights. One piece of good news is that Adam has been allowed to go back to having small tasters of food a couple of times a day – just fruit purees and tiny morsels of chocolate on his lips but this has made him immensely happy, and us too. We are now waiting for a date for Adam to have surgery to remove his tonsils and adenoids, which the surgeon tells us could significantly improve his breathing and reflux. He will be admitted, all being well, sometime in March (we had a date of Feb 3rd but it was cancelled) and they will investigate his larynx at the same time as it is possible he has an obstruction. If this goes well, we will be able to go ahead with a possible fundoplication, more investigations of his stomach and lungs, and also a new videofloroscopy with a view to reintroducing solid food. We are extremely grateful to everyone who sent Adam and Hannah post in the last couple of months. Adam kept his Christmas presents until Christmas Eve, and was delighted with every single one. Paul and I continue to be so touched by your kind thoughts and all the love and smiles you send to our little man. The four of us send lots of love and thanks to everyone (and there were a lot of you) who sent something, and we hope to send out thank yous as soon as we can (sorry for the delay!). Adam and Hannah have enjoyed choosing gifts and cards for other Pals and siblings too. Our thoughts and love are with every one of the Pals and their families, every day. Hi everyone I just wanted to wish you all a happy 2011. Adam and his little sister had a great Christmas, although he has been poorly again since. We are relieved that he has avoided hospital this time. Thanks to everyone who sent Christmas post, which really cheered us all up. Our thoughts are with all the Pals and we send our love. Throughout October, Adam has continued to recover steadily from his recent illness. He is still very tired and nervous of going out (we have to explain to him very clearly that he is NOT going back to hospital today). He has acquired a nasty and persistent ear infection because he spends so much time lying on one side, so that has been uncomfortable for him, but generally he has been trying hard, happy and contented. We have been getting increasingly frustrated by cancelled and rearranged appointments, which has meant that the surgery and investigations we were expecting him to have mid-October (giving him lots of recovery time before Christmas) have now been put off indefinitely for no real reason, so it looks like it’s going to be 2011 now. We’re also still waiting for someone to look more closely at his seizures. Our priority right now is to avoid him coming down with anything “minor” like a chest infection so he can be 100% for his duties as Chief Page boy at his Auntie Barbara’s wedding in a couple of weeks. Thanks to Post Pals as Adam and Hannah have now adopted one of Dottie the Dalmatian’s litter mates, and called him Indiana (Indy for short) as suggested by their Dad. He has been on several family days out already and is a much loved new friend. Adam and Hannah have also enjoyed choosing and sending out post to other Pals. A big thank you to anyone who has sent Adam and Hannah post this month. He was the centre of attention at the nursery Halloween party thanks to the lovely treats from Carol, Kate D and Post Pals. Hannah enjoyed carrying the pumpkin lantern round the Metrocentre last week and got lots of smiles. We were delighted to receive a lovely postcard from Heidi in Netherlands. Susan very kindly sent Adam some Toy Story things and Hannah a great book, which they loved. Marti sent some lovely books with cds which have been helping Adam to get through the sleepless nights happily (and us to relax!). Sarah G continues to send her wonderful letters which Adam listens to with great interest, and the fabulous pig card from Jazz is also very popular. A huge thank you as well to Donna Bedford who sent a lovely bracelet for Adam, even checking to see what his favourite colour was, and a Hello Kitty keyring for Hannah. Thanks to Jenny for her letter – we would love to reply but you didn’t put an address. If I’ve missed anyone out I’m really sorry. We are starting to send thank you’s to those who put an address. Paul and I are so grateful to everyone who takes the time and effort to contact Adam. Your generosity is just amazing, and we want you to know that you make such a difference to Adam’s life, giving him so many smiles, and to ours. We send all our love and best wishes to all the Pals, their siblings, Mums and Dads, and to everyone involved in Post Pals in any way. Adam spent late August and September in PICU and Ward 1 at the Royal Victoria Infirmary, Newcastle, after being taken suddenly and very seriously ill on 22nd August. His diagnosis was Toxic Shock Syndrome, with pneumonia and tonsillitis to complicate things. After a few anxious days, we were told he would pull through, and although he was ventilated for a total of 10 days, made a characteristically quick recovery. He is now home, and awaiting appointments for follow ups from ENT and gastro surgeons, who think they can help with his breathing problems (the ENT doctor called his tonsils “too juicy”) and maybe reduce his constant vomiting. Adam’s ulcers have flared up again as well, and are causing him a lot of pain, especially in the night. Whilst in hospital, Adam started having a different type of epileptic seizure, and these have continued since he has been home, so he will be back to the neurology department in the near future too, for an EEG and MRI. He has a few difficult months ahead, but we are hopeful that the doctors are right when they say the new treatments may be life changing. Adam, despite being extremely tired, has continued to be his lovely, giggly self, and was very pleased to finally be able to go back to nursery. Unfortunately for a little lad who loves biscuits so much, he has had to go nil by mouth for the foreseeable future, as eating and drinking is getting too dangerous to his health. He is working hard on his physio and communication exercises and we even think he may have tried to copy his sister talking the other day. Use of his right hand has improved from helping to open so many envelopes! Adam has very much enjoyed his first month with Post Pals and now recognises that an envelope or parcel making its way over to him is going to contain something exciting. Thank you to everyone who sent something – if you included your address, we will be in touch soon! Thanks to Anne for the dinosaur card which made Adam laugh so much; to Sarah G for the teddy card and the lovely story which has been read out about 5 times now; to Becky Fisher for those lovely pictures (especially the fire engine) and her letter; Juno – Adam loves his mobile; Kate W – Adam and Hannah have both enjoyed reading Zigby over and over again; Jane sent a lovely set of pictures of her cat which Hannah in particular was fascinated by; thanks also to Carol who sent the Toy Story sticker book, which we’ve all had fun with (Mum and Dad included), and finally to Percy – Adam thinks you’re the cutest dog in the world. If we have forgotten anyone, our apologies, and thank you for welcoming us so warmly to Post Pals!